How much profit you expect to make or funds you hope to raise. You cannot be sure what any of these numbers will be until the quiz has happened, because there may things that might vary - eg if it's raining your attendance may be lower than you hoped for. 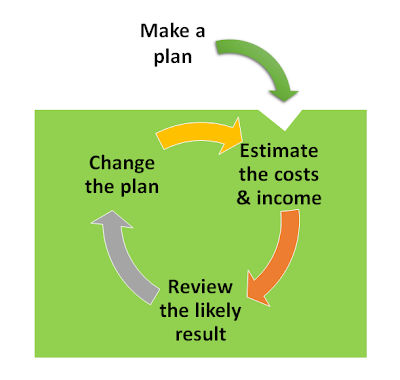 But in the same way that it's good to write down how you plan to run the quiz (so you can see any potential problems and take action to stop them happening), it's also good to write down how much money you expect to spend, and make, so you can change your plans and do things differently if your quiz might not meet your goals. This written-down statement of how much you expect the quiz to cost, and how much money you expect to make is called a budget. And budgeting is all about making plans, guessing how much they will cost and how much money you will make, and making sure that you are happy-enough with the result. How complicated should a charity-quiz budget be? The short answer is "just detailed enough so that you understand what might happen, and can change your plans to adapt". 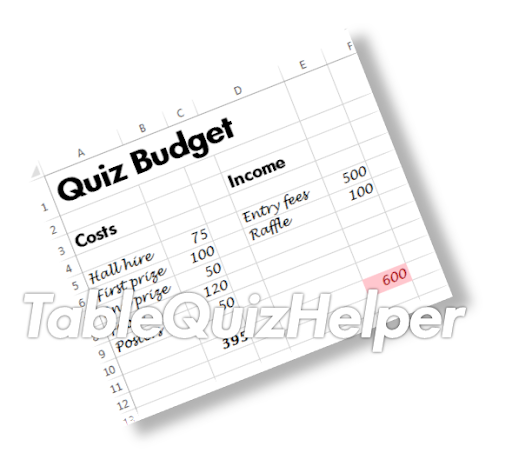 If you regularly run a quiz, then you probably to have a good understanding of the likely costs and income: you will be able to "balance your budget", ie make sure that your income and expenses line up, without much trouble. You might not even need to do a separate budget for each event. But if you are new to running table-quizzes, or you are running an event that is a lot bigger or more complicated than you are used to, then it is good to spend more time investigating likely costs and estimating the overall money. Make, or find out about, the plan for how the quiz will be organised. Using the plan, make a best-guess about what you will have to pay for, and how much each thing will cost (see "What to budget for" for hints about this). Make a best-guess about how much income you are likely to get. Add up the total income (what you will make) and expenses (what you will have to pay for), and work the difference. Think about the results. If there is a problem then review your plans and repeat steps 2-5. Do this over and over again, until you have a plan that you and your team are happy to carry out, and a realistic budget. If you are in a very formal situation, then you might even want to get the manager, committee or other officials to formally approve your budget. When you start planning to host a quiz, you don't know what things will cost, or what you will need to pay for vs what people will lend or donote. But to get an idea of whether your plans are realistic, you need to make some estimates - which I like to call "best guesses". To start with, these won't be very good: you probably have no idea what it will cost to hire a hall, print posters, rent a PA system etc. So the first step is to either make an outright guess or - better still - to ask someone who's done something similar for a rough idea about what things cost. Then, you work on your plans for the quiz, you can get better information by asking people who know, and update your budget with this. You know you will need some posters. You have no idea what it will cost to make them, so put $100 into the budget initially. Then you talk to Bob who did the publicity for last year's quiz. He tells you that posters cost $200 last year. So you update the budget - and realise that this could cause a problem because you want to charge a lower entry fee this year. So you talk to the organizer, who introduces you to Sally who offers to design the posers for free, and says that she can get 30 of them printed for $1 each, and that her friend will put them up around town for $20. So you update your budget to $30 + $20 = $50 for posters. You will have to update your budget three times. But each time, the information gets better, so you can be more confident that it will be "about right" on the day. Preparing a budget that everyone is happy with is the first step in managing the finances for your table quiz. It's important - but it's not the end of the story. Next, you have to keep an eye on what happens while the quiz preparations happen. How much will things actually cost? Do any unexpected costs happen? Are the bills being paid? Is the sponsorship that you expected to get coming in? If anything happens that is very different from what you expected, then you might have to review the budget yet again. Just remember - this is a good thing: you can use your budget as a tool to keep checking that you will meet the goals of your quiz, no matter how the plans change. 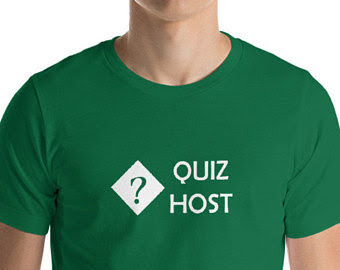 What your quiz will cost to run depends on how it is organised, what facilities the venue has, what supplies you need and what you have to pay people to do: even if you have a team of volunteers, you probably need to pay for the materials that they use. Contingency - if you think there's a chance that something will go wrong, or that some extra expense will some up late in the process (perhaps after you have paid deposits for other things so cannot change your plans) then you might want to budget for this too.